The environmental issues are predominant in the French Agendas 21: energy and climate was a priority, regarding to the international mobilization since the Kyoto Summit in 1997. The second priority is the protection and preservation of natural resources, waste decreasing and behavioral changes. The process Grenelle de l’environnement precisely concerns these issues. Further, local authorities that were previously committed to a local Agenda 21 have gotten ahead of schedule regarding the implementation of measures. 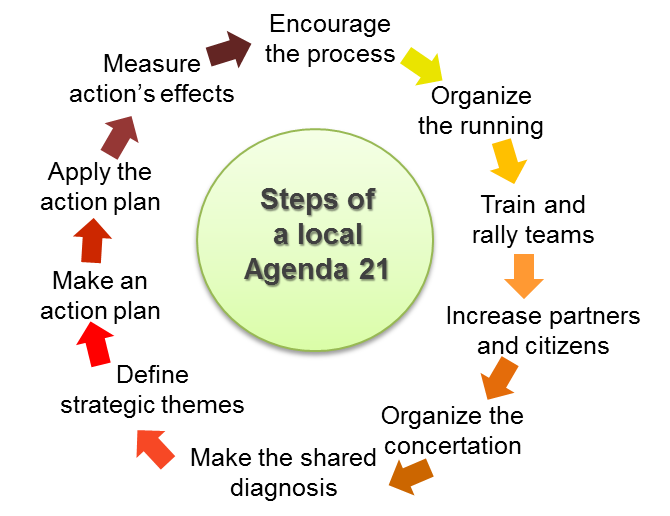 In fact, the first generation of local Agenda 21 was essentially made of internal plans of eco-responsibility. Although they were elaborated conjointly with the population, their perimeter of deployment was the administration and the public policies of the local authorities. They specifically involved the services and elected people. This approach is not specific to France, but also shared by local authorities in other European countries. Since the end of the 2000s, local authorities are facing social and economic issues in the context of the global crisis. They commit themselves to solve these issues through their policies, which were reinforced with the second act of decentralization in 2003 and the State’s financial retreat. Then, they strived for implementing the purely environmental approach of the Grenelle de l’environnement, which was pointed with the debate on the carbon tax and the “double punishment”. They started to act on the social acceptance of the measures of the Grenelle, by acting on energy precarity for example.